Home Park sits within the confines of a park area just over a mile north of Plymouth city centre. 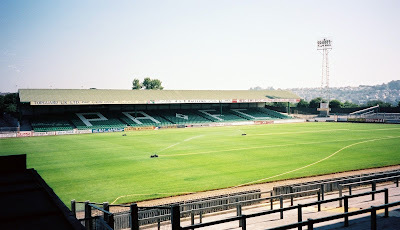 The ground has been home to Plymouth Argyle since 1903. When I visited the stadium it was very different to how it is now with just one all-seater stand in place, the Mayflower Grandstand. The remainder of the ground was taken up by terraced standing. In 2001 the club began a substantial redevelopment which converted the rest of the ground to all-seater with the three new sides forming a bowl shape, giving the stadium a total capacity of 18,000. The club plans to redevelop the Mayflower Grandstand in a further development but this as yet has not occurred. At some point I will return to Home Park to do a more expansive report on the stadium but the fact it is the second furthest away of all 92 Football League grounds for me means it is not at the top of my to-do list.